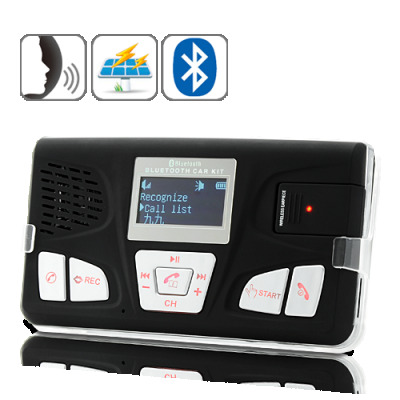 Successfully Added Solar Powered Bluetooth Car Kit with Voice Control to your Shopping Cart. Clean, green technology merges with advanced engineering to bring you this Solar Powered Bluetooth Car Kit with Voice Control. Make your drive easier, safer, and cleaner. You're cruising down the highway at 60MPH and your phone rings - it's your boss. You have to answer, but fidgeting with your phone while driving risks the chance of accidents... unless you have this Bluetooth Car Kit with Voice Control. Featuring advanced DSP technology for speech recognition, you can answer calls, call people in your phonebook, change the volume, change songs, and so much more! No more risks; put both hands on the wheel because you can voice control everything! This solar powered Bluetooth car kit comes with a solar panel that will charge the device automatically. Thanks to the transparent holder and suction cups, you can leave it on the windshield to receive maximum sunlight so you'll never have to recharge or even move the device, how convenient! For those cloudy days, you can also power the Bluetooth car kit directly through the car's cigarette lighter socket or by USB. With Bluetooth 2.0 technology, simply pair up your cell phone with this solar powered Bluetooth car kit for handsfree operation. Then, stick it on the vehicle's windshield, or even clip it onto the sun visor, for the safest and most convenient way to talk and drive. This versatile device even has a built-in speaker, microphone, and OLED screen for caller ID display. Phonebook support is also provided, along with callback, ensuring that you never miss an important call. If you don't want to miss out on that business deal, but also don't want to divide your attention while driving, then this solar powered Bluetooth car kit is for you. This device reduces traffic accidents by providing you the the safest and easiest way to make and receive calls while driving. Order now and we'll ship it out tomorrow. Brought to you by the leader in China Electronics - Chinavasion. Voice control/recognition for answering calls, dialing numbers in your phonebook, and more! How come the voice commands aren't working? First, you will need to "train" your voice so the Bluetooth Car Kit can recognize it. Press the "REC" button, then repeat the words that come up on the screen. A full charge will require about 11 hours out in the sun. Perfect if you park outdoors or drive during the day!